Seems like it was around 1998-99 that a friend in Boston emailed me to see if I'd be interested in beta-testing something called an electronic book. She was part of the marketing team conducting research on whether or not regular people (glad to know I was considered "regular") would want to read electronic books. Her company was working with Stephen King to develop this groundbreaking idea of books that didn't have to be printed. 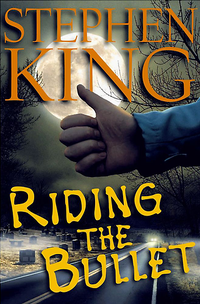 Being a loyal Stephen King fan, I jumped at the chance and within a couple of days received the file and began reading. To give you an idea of how novel this was, here's a link to an article about the launch of the novella. It was quite an event at the time! I loved the story, but what a pain to read! There were no e-readers at the time, although they were being discussed in hushed tones. I read it on my gigantic Compaq monitor, which was about the size of my microwave oven. Having to continually adjust my neck and head to keep the page in range of my glasses gave me a headache AND a backache. 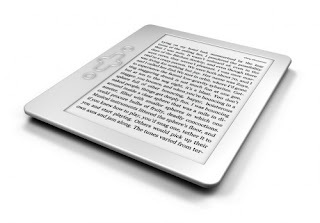 Until such time as technology could deliver a lightweight and affordable e-reader, I was not interested in electronic books. Period. And then came the Nook. Well, not exactly RIGHT then. About 7-8 years, if I recall correctly. Even then, I just didn't want to spring a few hundred dollars for a reader.Well, like all things technology related, the products have evolved, improved and gone down in price. And now? I'm just as hooked as everyone else! I actually have multiple readers these days - two Kindles, plus apps for my PC, iPhone, and iPad, Plus iBooks on my Apple devices. I wouldn't dream of taking a trip without one of them now. Slipping my tablet into my bag is so much easier than schlepping a bag of books around an airport. I've also become addicted to the Kindle Bargain and Free Books. I get a daily email listing them, and comb through it, greedily downloading everything that looks interesting. I'm developed my own little free library. Stephen King was the first major author to challenge the assumption that only print books were 'real' books. His goal was to make his works accessible to a broader range of people. Was he "ahead of his time"? Yes. Was he right? Yes, he was. Today, self-published eBooks are a huge part of the marketplace, thanks in large part to his willingness to break from tradition. And of course...that little game-changer called Amazon. I've discussed these topics and more in a webinar on eBooks for indie authors. If you'll look at the top of the page for the "eBook 101" section, you can find the transcript, btw.